Coding seems to be the thing to do these days. They say if you have coding experience you will have a leg up in the computer programming field. 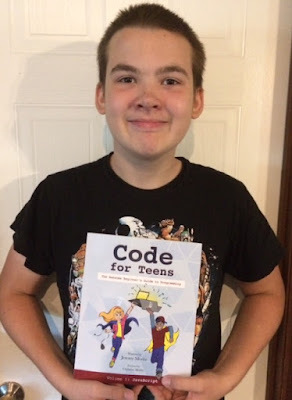 We were glad to say "Yes" to have a chance to review Code for Teens: The Awesome Beginner's Guide to Programming (Volume1) from Code for Teens. What makes this book different than any other code book is that it is specifically written for your teens to complete on their own without any adult intervention. It is written for grades 6 and up. The author, Jeremy Moritz, wrote this after he had worked and practiced the lessons with his own kids. He found a way to reach out to teens on their level with step by step instructions and a little humor along the way. I received a physical copy of this book. It is a very nice softcover book with heavy-duty glossy pages. Included in its 219 pages are an intro, parent note, 10 chapters, answer key, and a fairly extensive glossary at the end. You will need a computer or laptop to complete the lessons. Tablets will not work for this. You need to be able to download Google Chrome (free download) to complete the coding instructions. Why then you say, would you want this book? Because it really is written for your teen. If for some reason you do get stumped there is a forum available where the author or someone from his team will be able to help you out. The link to the forum is available on the Code for Teens website. It's easy for our teens, especially our boys, to get distracted from the lessons at hand. This book is written to keep them engaged and entertained while they learn at their own pace without stress of a strict timeline or deadlines. At the end of each chapter is a Quiz (remember there is an answer key in the back of the book), Key Concepts (quick chapter review), and Drills (more practice and includes a DIY section for even more practice). Basically, there is review, review, and more review so your teen can get the concepts down and feel confident moving forward. The concept of constant review follows throughout the entire book so they don't lose what they have previously learned. You can proceed through the book at any pace you or your teen chooses. Our goal is to complete a chapter per week if time allows in our schedule. This seems to work to not get him too overwhelmed or feeling pressured, especially since it is still technically summer! This book definitely seems to be more up my teen's alley in the sense that he can actually accomplish something and not feel as if he is failing. If you have a teen that doesn't generally struggle through their lessons then they will probably be able to complete the book fairly quickly. It is such a wonderful tool to teach them skills that they can use going forward. I think the one thing we would change that would make it easier to use is for it to be spiral bound so you can lay the pages flat as you are trying to type the code out. If you are thinking about or interested in learning to code at all then we definitely recommend Code for Teens: The Awesome Beginner's Guide to Programming (Volume1). You can also connect with Code for Teens on FACEBOOK. If you still aren't quite sure then take a moment to go to the Code for Teens website and download the introduction and first chapter for FREE! Also be sure to check out what the other reviewers have to say about this wonderful resource by clicking on the graphic below.